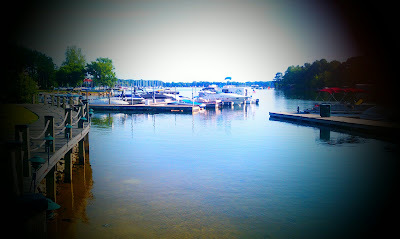 I'm loving the life that we have in North Carolina! Bryan and I feel so blessed to be living the life we are. Work hard. Play hard. It just continues to get better and better for us! But if you were to ask my mom, she'd say this is typical for me and that I was "born under a lucky star." She's right. I must have been! I'm loving that we went to dinner at Latitude 36 a couple nights ago and used a groupon. Love me some groupon! I'm loving that we bought a formal dining room table yesterday. 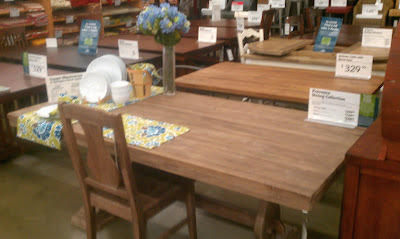 And since we're not formal people, our table is the perfect combination of informal chic. It's going to look great in our dining room, and when I'm done accessorizing the room, it'll tie in perfectly with the formal living room we envision. That's my goal, at least! I'm loving my job! 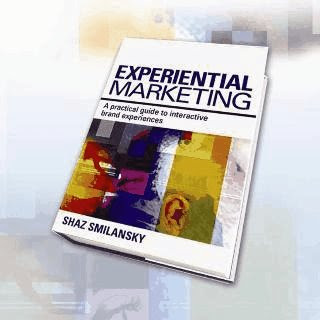 In October I celebrate 10 years working in this industry -- my my, how time flies when you're havin' fun! I'm loving that our apartment is the most desired in the entire complex! When the front office found out we were moving out, they had people lining up for our specific apartment. The lucky people already live in our complex and want our apartment so bad that they're going to move a few doors down. This means we're able to break our lease with no penalty charge! Happy. Happy. Happy! I'm loving that the electricians put in the fan we bought and that we didn't have to do it ourselves after closing. And with the heat the way it is, shoot... every room's going to need a freaking fan (but they're not getting one - just the family room and bonus room. 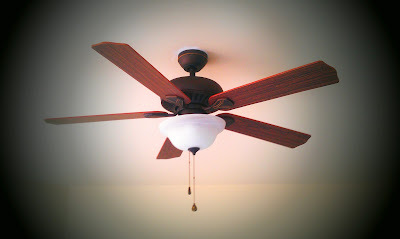 I'm not a fan of fans, hehe!!)! 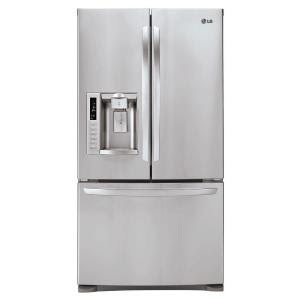 I'm loving that after comparing prices/sales at Lowes, Home Depot, hhgreg and the Sears Outlet, Bryan bought us our refrigerator for the best price during the Father's Day sale and it'll be delivered on our move-in day! I'm loving my husband. He and I are just two peas in a pod and sometimes I can't believe all that we have accomplished in our short 3.5 years together. I love that we're married.... that he's my guy...... that he buys me flowers, tells me why I'm pretty and rubs my back every night..... that he makes me laugh and makes my blood boil on a daily basis... that I get to spend my life with such a cool guy! Love him. Go link up with Jamie and tell us what you're loving this week! And just for shits and giggles... You wanna know what I'm not loving this week? I'm not loving that I forgot to FedEx my expense report on Monday and then didn't get around to doing it until today. This means delayed reimbersment. Boo! I'm not loving that people in the south don't stop for pedestrians. Some people stop, but I've noticed that most speed up. Oh, and if you're backing out of a parking spot (say at a grocery store, Target, etc) instead of waiting for you to get out of your spot, so many people continue driving down the row and just swerve to the opposite side so they don't hit your car. This means that you have to slam on your brakes otherwise you will back up into the stupid car that couldn't just stop for 5 seconds for you. Californians are much nicer in that regard -- everyone yields to pedestrians and stops for a backing up car! I'm not loving that my Home Goods hasn't had good dog toys in stock for over a month now. Get it together. My dog needs a new toy... she's down to 3! I'm not loving that we came home from the beach this weekend to a flat tire. And next thing you know, we're unexpectedly buying 4 new tires for our car that we're trying to sell. UGH, annoying!!! I'm not loving that I haven't had on a bathing suit in about a month. That means no tan for me! It's a good thing though -- gotta start taking care of my skin a little better and that means way less sun for moi. Okay, that's enough negativity outta me for the week. Off I go to the dentist and then I get to spend the rest of the afternoon with my man!! Kate, make a little room for me on the soapbox regarding NC driver's lack of respect for pedestrians! It drives me crazy some days! The worst is when I'm trying to get from the parking lot into a store and it's really hot/cold/rainy ... and some jerk in their cooled/heated/dry car is barreling thru the parking lot, causing me to have to wait for them to pass or get smooshed. It irritates me so! What kind of car are you trying to sell? You think Ash ends up with JP? I kinda agree with you about Ashley..she is starting to annoy me more and more. Of course I still won't stop watching. I spy WORLD MARKET! Is that where you got your dining table? If so, excellente pick my dear :) Also did you paint your front door red?! We are twins! umm if that first photo is your new house...i am completely jealous!!! 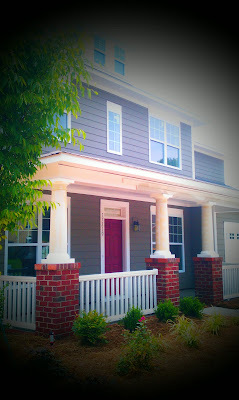 i have always wanted a front porch and a red front door. love it!!! 1. i didn't realize home goods sold dog stuff, def must check it out. 2. love that your car tells you the tire pressure of each tire... mine just has this funny light that leaves you wondering what the heck is wrong. Is that first picture your house?? It's so pretty! Was that a pic of your house?! More please! I agree...Ashley is driving me crazy! I've missed you so!!!!!!!! Hate missing yours posts. kids. KIDS! Don't have kids, you will never ever be able to keep up on ANYTHING again in your life. Work hard, play hard. The motto my hubs has always lived by. And he does both. HARD. still have no idea what a groupon is. ha love the formal dining table! We also are SO not formal either. Our formal dining room table is covered with Gunner's Thomas the Train crap. awesome about the apt!!!! no penalty charge, some people have all the luck. 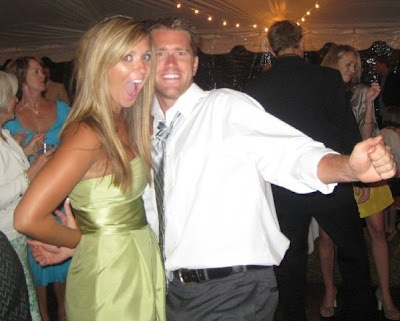 If only you and your hubs werent so good looking, I may have SOME empathy on you but nope, none. love the fridge. we have one almost just like it. SO excited for you moving into the new house!!! KIDS! People in the south don't stop for peds? RUDE! Your dog is down to three toys. HA! love that. 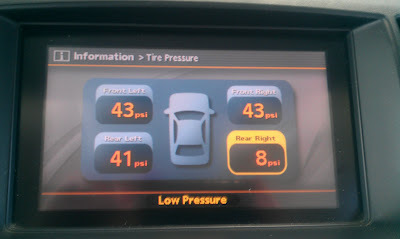 My car has been telling me that all four tires have low pressure, and I have no idea what that means. Should I get it looked at soon? Could it be dangerous? what's this about your niece and nephew? Why wouldn't you be invited? WHO would ever snub YOU? seriously, who? I HATE ASHLEY! and then say, WORSE THAN LORENZO HAHAHAHAHAHAHAHAHAHAHAHAHA!!!!!!! JP is SO my type. love you. and do have kids. Then you can join in my misery.